Pregnancy following a miscarriage can be a testing time in many ways for a mother - and for a father too. There are so many complicated feelings involved! On the one hand, there is the loss to grieve over. On the other, there is the joy of expectation. On top of that, there may be many anxieties about the new pregnancy. It can be a real challenge to stay calm and positive throughout the pregnancy. If the miscarriage was recent, you may still be grieving. Even though you may be delighted that a new pregnancy has started, the pain of that loss does not diminish straight away. It can be hard to deal with the congratulations of friends and family. Yes, you are happy, but you are still sad too. And it hardly helps when people say crass things like 'the new baby will make up for the one you lost'. 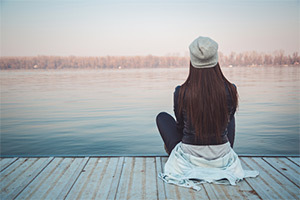 If you have become pregnant again after a miscarriage which occurred a long time previously, you may be surprised at the feelings of grief that swell up alongside your joy. You might even feel guilty about being so happy, feeling as if you are somehow betraying the child who went before. But this swirl of emotion is completely normal. Pregnancy is an emotional time anyway, but especially if preceded by miscarriage. Dealing with all these emotions is complicated by the question which is foremost in your mind: "Will this baby be all right?" Whatever caused you to miscarry the last time, it is natural to be concerned about the well-being of your unborn child. You will do everything you can to see it all goes well. You will eat right, exercise properly, take all the ante-natal advice you can get and follow it scrupulously. But even if you do all that, you are still quite likely to worry a lot. Which puts you in a Catch 22 situation, because worry is bad for you and your baby. Worried parents may be flummoxed by this. "How can we not worry about our baby, after having a miscarriage?" If you've had more than one miscarriage, this could be even more likely to make you anxious about subsequent pregnancies. This is where hypnosis can really come to your aid. You already know that just telling yourself to stop worrying about the pregnancy doesn't help you much. It's as if your thoughts just turn of their own accord to what might go wrong. And you can really frighten yourself with the scenarios you can dream up. To break through this vicious circle you need something more than just willpower and conscious intention. Pregnancy after miscarriage is an audio hypnosis session which uses powerful hypnotic suggestions to take you into a deeply relaxed, integrated state. You don't have to try to make yourself calm. It will all happen by itself. Entering this state and remaining there for the duration of the session is healing to both mind and body. The feeling of well-being that you will experience as you listen to Pregnancy after miscarriage is more than just a mood. You will actually be circulating 'feel-good' chemicals in your body as it relaxes - and these will also be circulating in the womb and transmitted directly to your baby. Pregnancy after miscarriage will guide you through a gentle yet transformative process of visualisation which will enable you to focus on the positive outcome of your pregnancy and the health of yourself and your baby. You will find yourself naturally becoming and remaining so much calmer as you continue to take all the necessary steps to care for yourself in the best possible way in your pregnancy. Download Pregnancy after miscarriage and really do the best for you and your baby. Pregnancy After Miscarriage has been purchased by 112 customers.